We were delighted to welcome Consul General Simon R. Hankinson and his wife Jill to our 4th July celebration. Since the closing of the U.S. Consular Agency in Nice in September 2015, we have missed having a close relationship with the Agency. With the arrival of Mr. Hankinson last July, we are looking forward to a closer cooperation. This is the second time he visits with us this year. 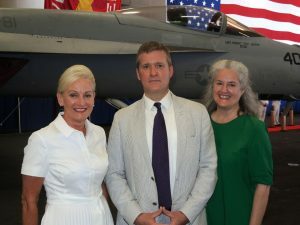 Jeanette with Consul General Simon R. Hankinson and his wife Jill.